On June 7, 2016, the ANS honored Dr. Michael Alram with the 2016 Archer M. Huntington Award in recognition of his outstanding career contributions to numismatic scholarship. Dr. Alram is a distinguished scholar, scientist, researcher and teacher who has been a formidable presence in the numismatic community for the past four decades. Remarkably for such a scholar—and most fittingly for the mission of the American Numismatic Society—he is a rare example of a researcher who has strived throughout his career to bring the study and love of numismatics to a wider audience. He is also an exemplary model of administrative accomplishments, serving in leadership capacities at the Coin Cabinet of the Kunsthistorisches Museum in Vienna, the Austrian Academy of Sciences, the International Committee of Money and Banking Museums and the International Numismatic Council, where he currently serves as President. Dr. Ute Wartenberg Kagan, Executive Director of the ANS, noted the historical significance of this year’s choice of honoree: Dr. Alram is the 95th recipient of the Huntington Award, yet only the third Austrian to receive it, and the first since World War II. The Archer M. Huntington Award, first presented to Edward T. Newell in 1918, is conferred annually in honor of the late Archer M. Huntington, ANS President from 1905 to 1910 and a major benefactor, in recognition of outstanding career contributions to numismatic scholarship. 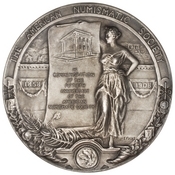 The medal was designed in 1908 by Emil Fuchs to commemorate the 50th anniversary of the founding of the American Numismatic Society.